If you’re new to this series, Clark is my flip house (named for the street that he’s on). Check out my previous progress posts here. Yesterday, the skies parted, the sun shone down, birds were chirping, and I did the biggest happy dance that Clark’s ever seen. 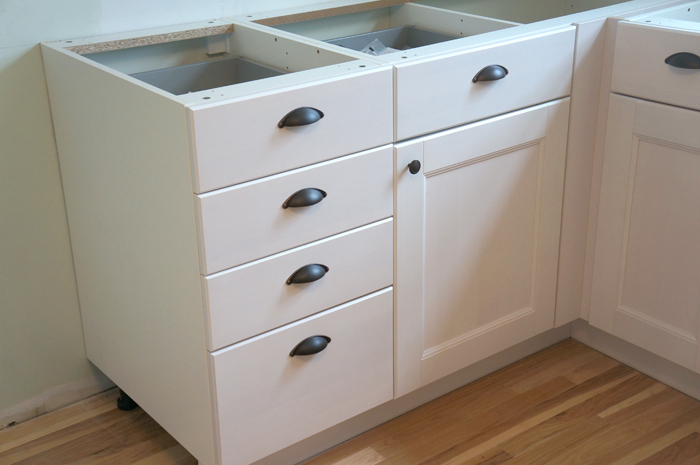 If you follow me on facebook or instagram, you saw a few teasers of the kitchen cabinets being installed at long last! 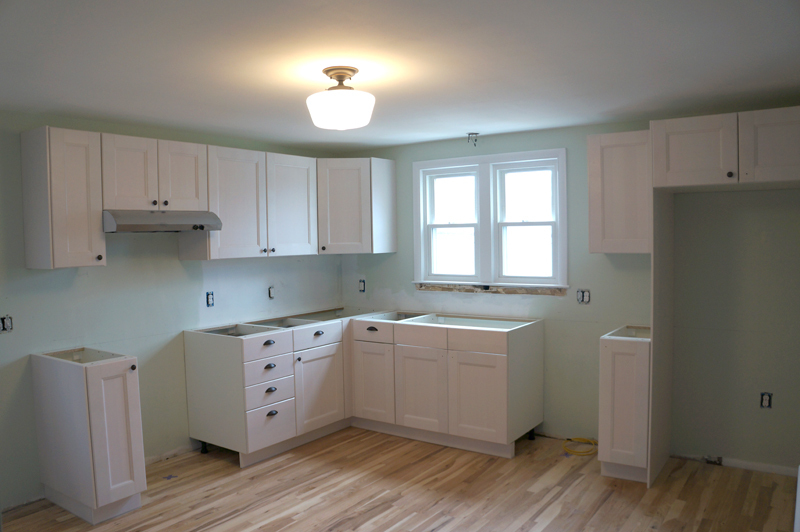 Before we start looking at complete kitchen, I need to express how utterly ridiculous this whole process was. This saga’s not short, so bear with me. I purchased the cabinets on March 1st. March 1st! Yesterday was march 28th! That was my first mistake, I guess- IKEA was having a kitchen sale. I didn’t get the discounts, though, because the total wasn’t high enough, so I just had to deal with the hoards of other people trying to get kitchens installed as well. I know IKEA cabinets are designed to be able to be installed yourself, but in the interest of time, getting them installed was the way to go (or so I thought). The install problems happened as soon as I bought the cabinets: IKEA wasn’t able to schedule it in their computer due to some glitch, so I had to call the installer directly. Ugh. After almost a week, I talked to the local installer, Frank. Oh Frank, you are not my friend. Frank was infuriating. All I wanted to know is WHEN you could install my kitchen. If I had been told 3 weeks ago that it would take 3 weeks, I would have looked elsewhere for install- BUT he wouldn’t tell me WHEN! Instead I had to call him almost daily (since he wouldn’t ever call back when he promised). First he told me last week, Thurs & Fri, then this week Thurs & Fri, and then when I called to confirm each time, I got pushed back. Luckily I had found another company and received a quote the first time my install got pushed back. When I talked to Frank on Tuesday and was told I had gotten pushed to Monday (supposedly) and that was the absolute last straw. 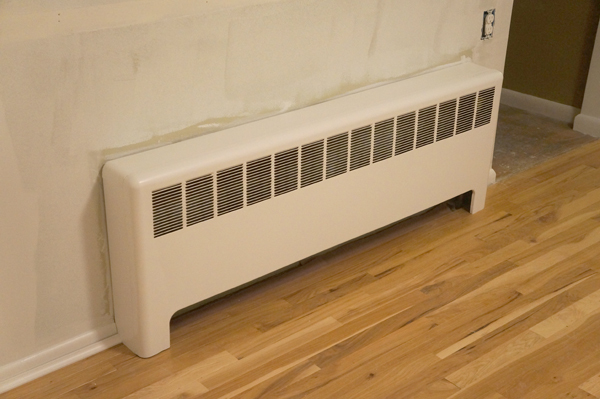 I called the other company (Kitchen Works Installations in Brookline MA) they came to the rescue! They were able to come and install my kitchen with only a day’s notice and in half the time they quoted!! AND for the same $ as IKEA’s installers with a fraction of the headache. I’m a little excited. I have nothing but good things to say about them, so THANKS!!! I would recommend them to anyone. AND as a bonus, I got to call and “break up” with Frank. I was very courteous, but it was so satisfactory. So if you’re thinking of getting an IKEA kitchen installed in the Boston area, save yourself the time and don’t go through IKEA. Appliances are coming Monday, the countertops are going to be templated hopefully in the next few days and the backsplash tile has been ordered! It’s about time!!! 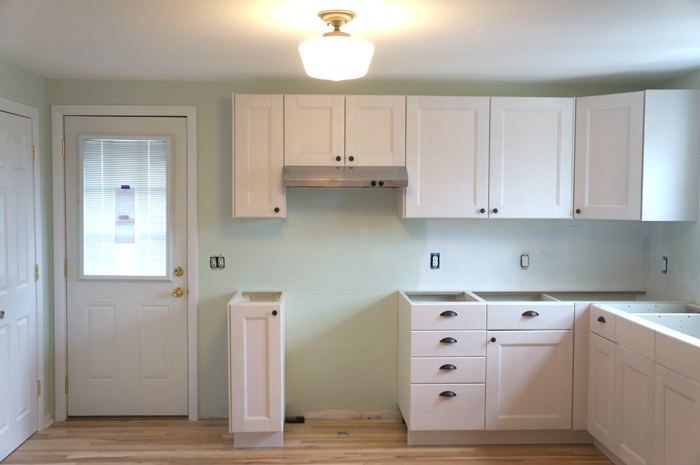 I scrambled to get the walls painted before the cabinets went up, but I love the color- a very light minty green. I know this is a flip house and the colors need to be neutral, but it can’t be sterile. The mint will blend very nicely with the light green penny tiles (ordered for 20% off- woot!). I bought out all the knobs at the Lowe’s by Clark, so I need to stop by another to get the last 6. Somehow, checking this one (albeit large) thing off my to-do list makes the whole house seem more complete. and I cut and started laying down the backerboard to prep for the floor tile. 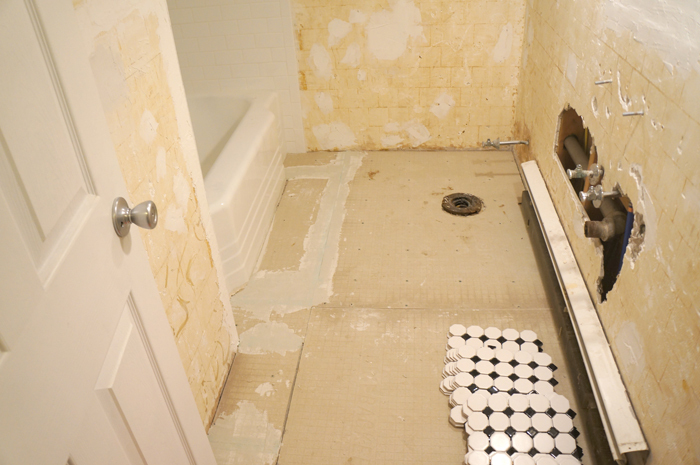 I have one more large piece to adhere down (it’s in the pic, just not attached to the floor) before I can get tiling. 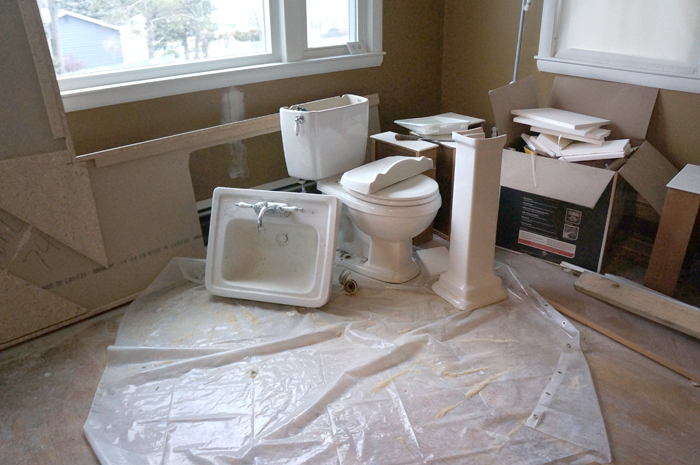 The toilet and sink are now hanging out on plastic in the living room. I think this is an up and coming design trend- plumbing fixtures as art. Don’t you think? The sink will be reused and the toilet replaced and donated, but this is motivation to move fast on the floors- driving to Dunkin’s every time nature calls will get old real fast. 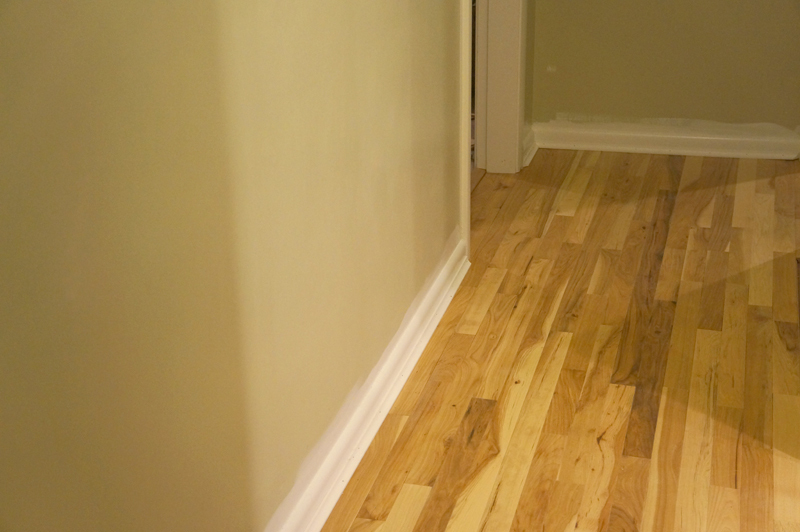 Aside from the leaps and bounds in the kitchen this week and the prep in the bathroom, I also got around to finishing some areas of the hardwood floors. and finished the transitions into the bedrooms. There are many other things in the works, too. I’ve been seeing this project come together in my head for so long, it’s so nice to start seeing it REALLY come together in reality! I can’t believe it’s Wednesday- I finally feel almost caught up from the weekend. My weekend was a roadtrip to Atlantic City for my BFF’s bachelorette party. I’m not much of a drinker, so it’s the late night and LOONG drive that wiped me out. 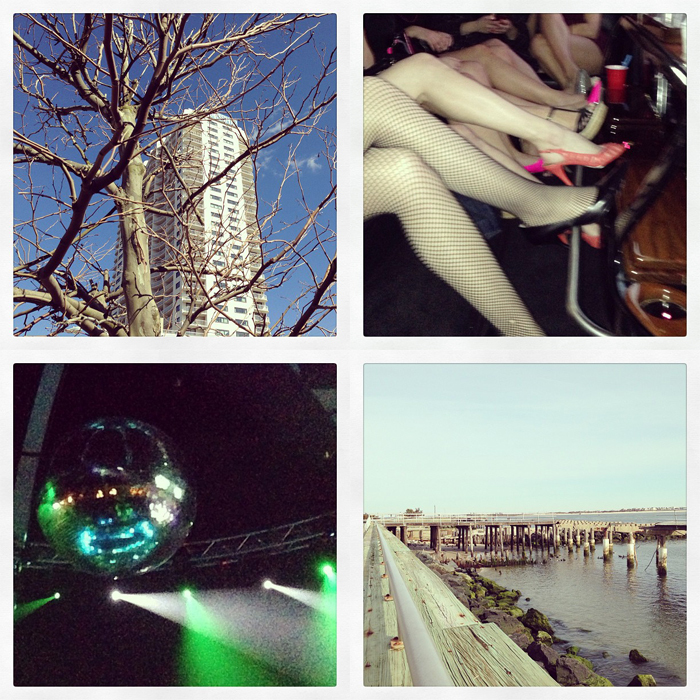 If you follow me on instagram, you saw my weekend in pics and how much I’m enjoying my new iphone. Aside from my new phone, I have another new favorite: gel manicures. This DIYer’s new best friend. I’m not generally an uber girly girl- I didn’t get my first manicure until college, and pedicure was only a few years ago. Obviously, being pampered is fun, but I’m cheap, so normally I’ll just do my own nails, especially since I’m so hard on them. Whether I do them myself or pay a pretty penny, manicures generally only last a few days MAX. It usually peels of the second I get my hands covered in paint, or I scrape it off inadvertently with sandpaper, or I just chip them by scratching something with my nail, or… you get the idea. 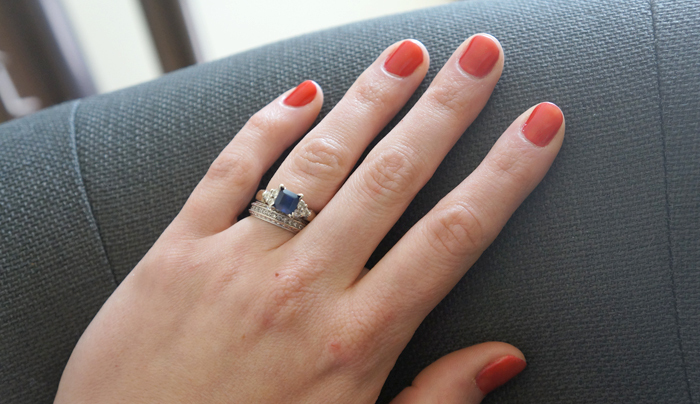 Enter the gel manicure (shelac or whatever brand that salon might carry). This is my second gel manicure ever (got it done in AC this time) and I’ve loved it both times. Granted, I’m sure I’ll still kill the manicure sooner than someone who’s a bit more gentle on themselves, but it’s been since Saturday and it’s still looking very pretty- already double the longevity of a normal mani. So far it’s held up to power tools, sandpaper, paint, and caulk! I almost want to see what else I can do to them to see how they hold up! I’ll admit, I started this week a little discouraged. I was making progress, but not the big strides I was hoping to. Plus more snow here in Massachusetts just made me want to retreat to my couch and hibernate. 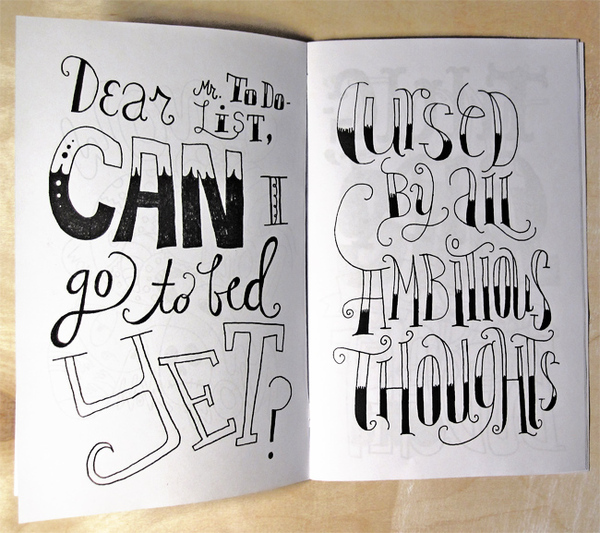 Luckily, I re-found my groove yesterday and got to check several things off my extensive To Do List. 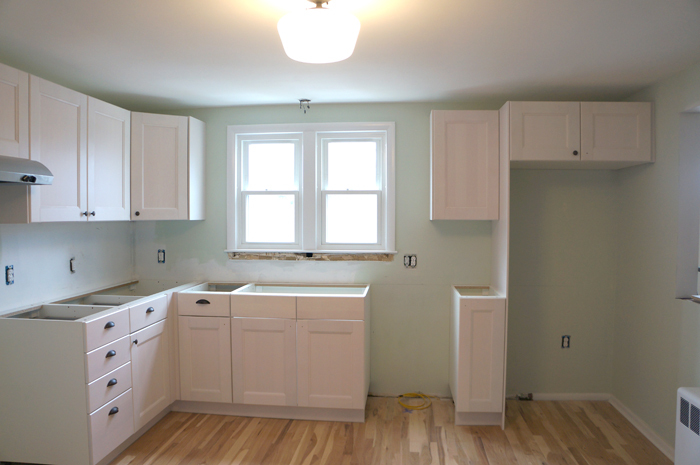 I did a lot of prep work this week to ready the kitchen for cabinets. I had high hopes of them getting installed at the end of this week, but IKEA’s kitchen installers had other ideas. I know I can install an IKEA kitchen, but in the interest of time, I’m hiring installers- or at least trying! I purchased the kitchen March 1 and have been going back and forth and not having my calls returned or being told they’ll call me later and maybe hearing from them 3 days later- this has been going on for THREE weeks! They’ve finally “put me on the schedule” for next Thursday and Friday, but I’ll believe it when I see it. I’m also shopping around to see who else can install, this is getting ridiculous. Ok, end rant. electrical was updated and brought to code. Now there’s even power for the fridge, dishwasher, and new vent hood! The old vent hole got patched. Did you notice the new light? 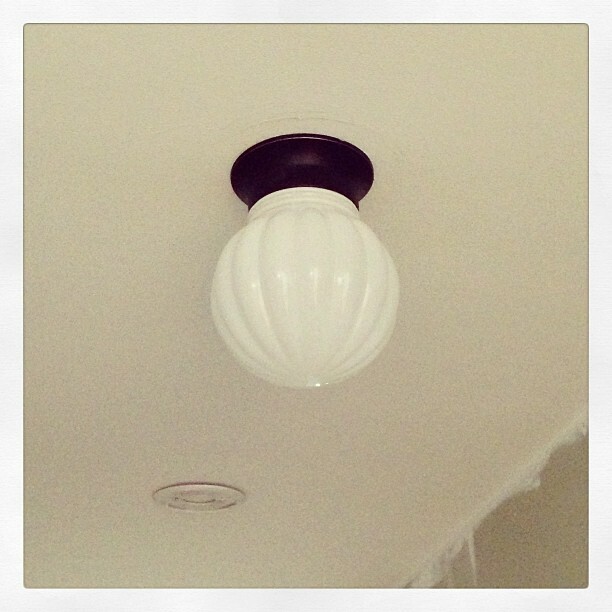 The new ceiling light in the kitchen (which you may recognize, since it’s also in my own living room) will go PERFECTLY with the $5 ReStore fixture that I got. The ReStore fixture got a few coats of oil rubbed bronze spray paint and a new chain and looks like a million bucks (in my humble opinion). The heating cover face was a challenge. I had to use a jigsaw with a metal blade to trim down the bottom- the body of the heating cover is fixed and I floored around it, but that meant that the face sat 3/4″ too high when I tried to put it back on. Once I cut it down, I filed the sharp edges and painted the beast to match the trim. Why, yes, there is a To Do list on the wall. 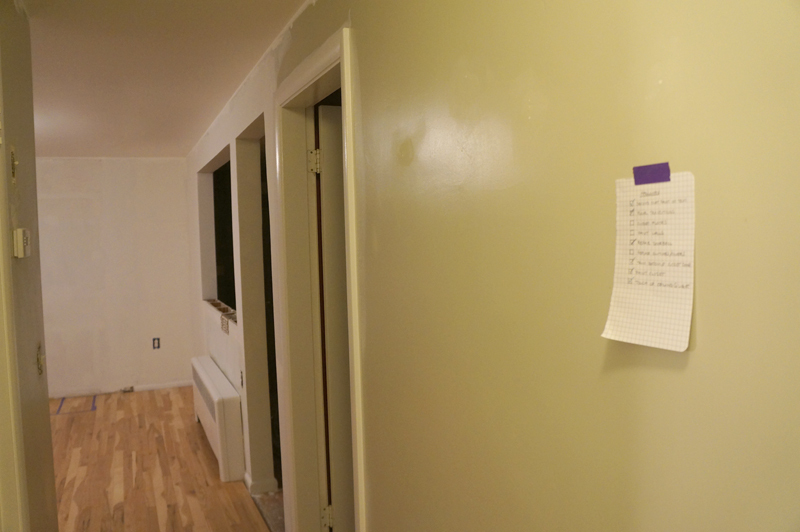 Last week I was the crazy person that taped out the kitchen cabinet layout, this week I’m the crazy person that taped a To Do list in each room to help me keep tabs on what needs to happen in each space. Plus, it would be a lie if I said I didn’t get tremendous satisfaction every time I got to put a check mark in one of those boxes. The hallway also got a lot of love this week since it’s open to the kitchen. I finally decided to work on the floor transitions that I had been putting off. 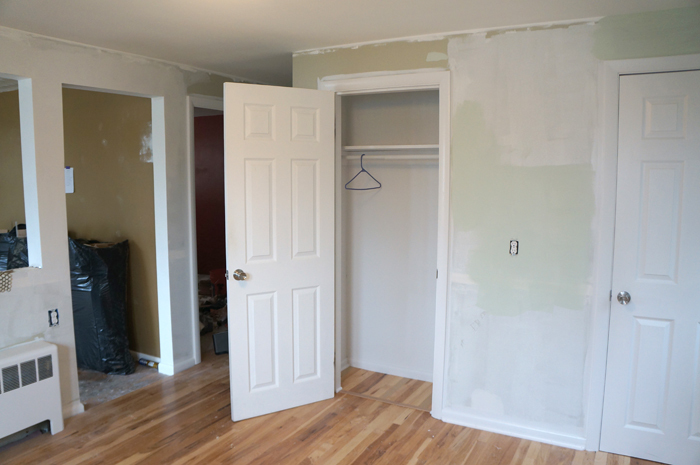 The 3 bedrooms have nearly complete transitions, so half the hall is starting to look finished! The other half is on today’s agenda. This picture of the hall is my favorite so far. I know it’s not that exciting, but it shows the most progress!!! It shows the newly painted ceiling and trim, the new hall light, a FINALLY working doorbell, AND a newly painted linen closet. 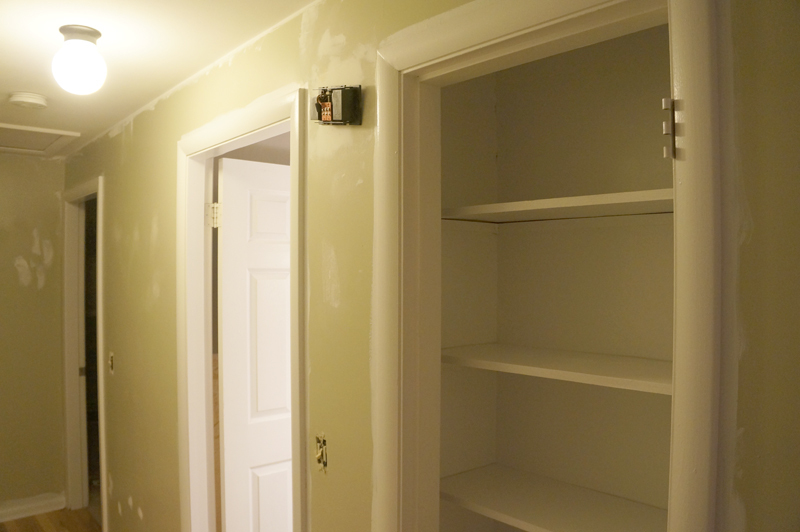 The closet painting was just SO satisfying because of where it started. If “dingy” was a color, that’s what the closet was. Now it’s a bright clean white. The bathroom is the next target. Since I’m hoping to be working on the floor tile when the kitchen is getting installed next week, I had some bathroom prep work to do. 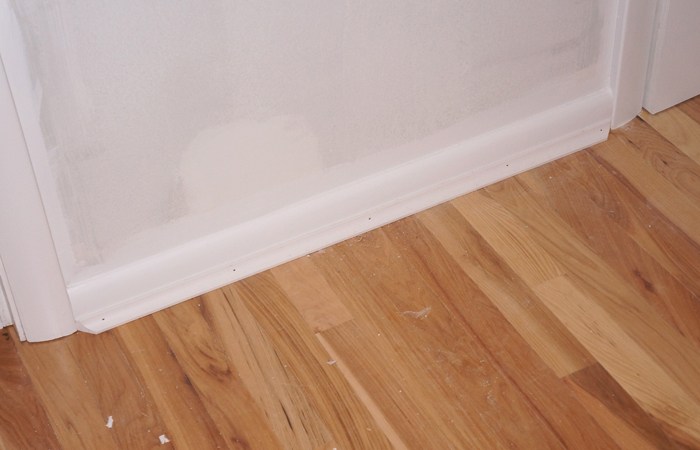 The wall at the corner guard is in the process of getting patched and the ceiling has been scraped, sanded and patched. 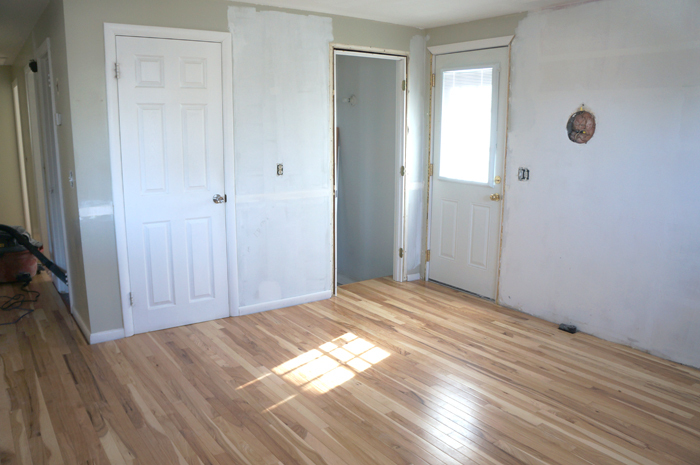 Next week I can get a fresh start and paint the ceiling and even the walls before I start tiling the floor. 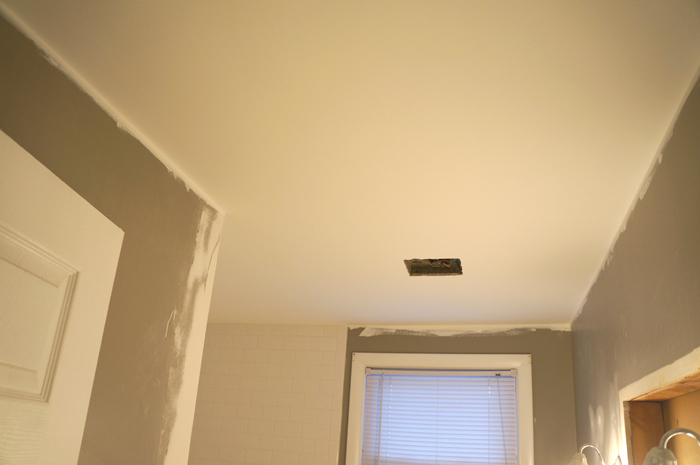 I can’t help but think I’m forgetting something that got done this week, but really, the ceiling and trim painting were the biggies. I spent most of my week with paint all over my hands because that’s what I do apparently. Hubby and I keep hearing about how HOT the spring real estate market is going to be, so we’re getting excited to get this guy back on the market! Only a few more projects before we can list. Just a few. 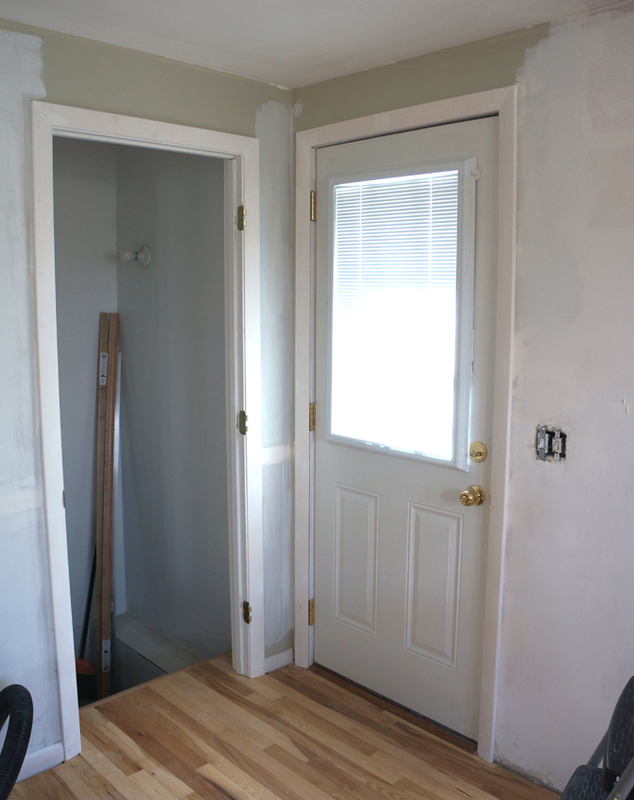 In last weeks Clark update, I showed you the new trim on the basement and side doors. 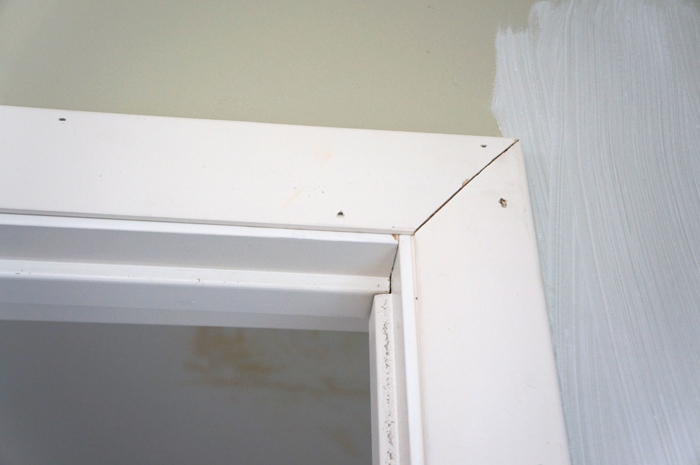 Today I’ll show you HOW to add new trim to a door (or window, or anywhere) and and make it look like it’s been there forever. First you need to remove the old or offensive molding. 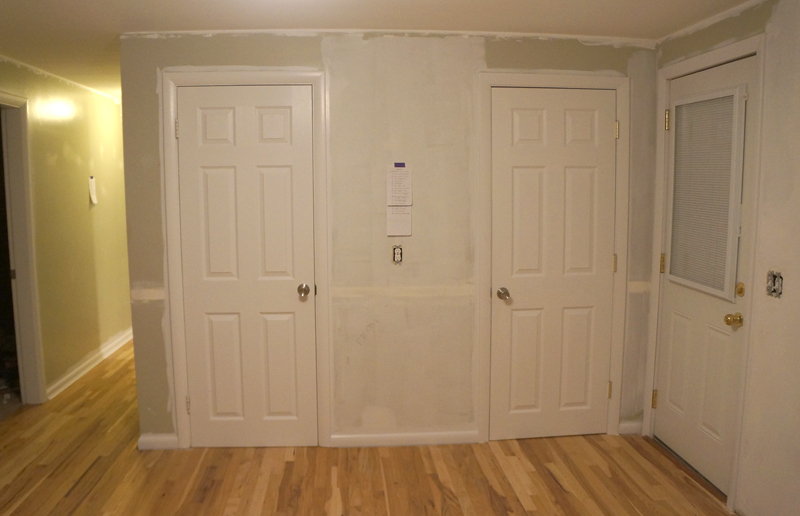 I chose to replace the trim on these 2 doors, because they had obviously been replaced by the last owner and didn’t match all the other moldings in the house (tip- match other molding when replacing a piece of trim- it’ll look seamless and original). I was a little overeager and neglected to take a picture of this step, so just imagine an image here of me using a prybar to get the old moldings free. Can you see it? Great! 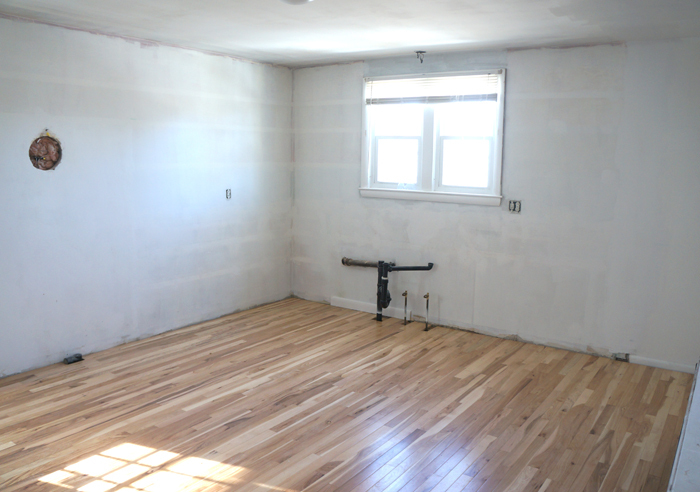 Now you have a blank slate. If you don’t have a compressor and nail gun, you can certainly use finish nails and a hammer, but this girl likes power tools. They’re fun. and much quicker. The trim kit was my other way of saving a little bit of time, but you can also buy trim by the foot at any home improvement store. Use your nail gun to securely fasten your new trim into place. Now, unless you’re a perfect measurer and builder, you’ll probably have a few small gaps. No worries- that’s what wood filler and caulk are for! Use wood filler (you can get this in white or whatever wood tone you’re using if you plan on staining) to fill the nail holes and the corner joints. Sand it smooth once it’s dry and no one’ll know. 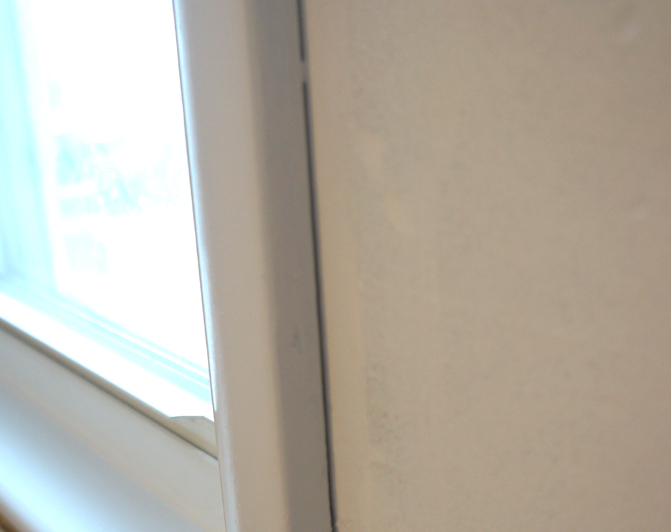 The step a lot of people forget is the caulk. 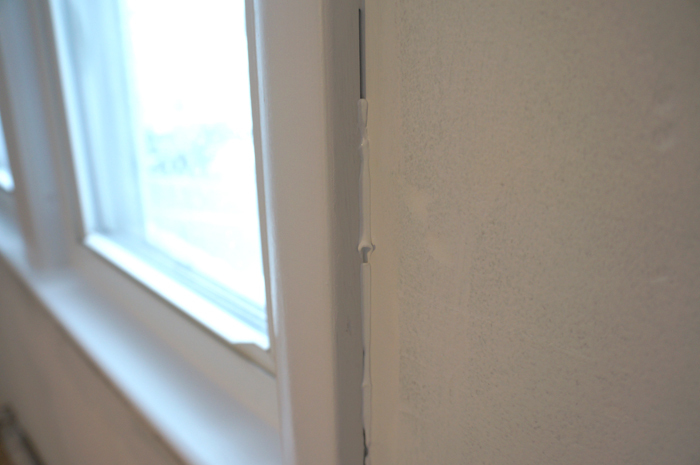 Make sure you get PAINTABLE caulk, because otherwise you’re work will look terrible when you try to paint the trim or walls. 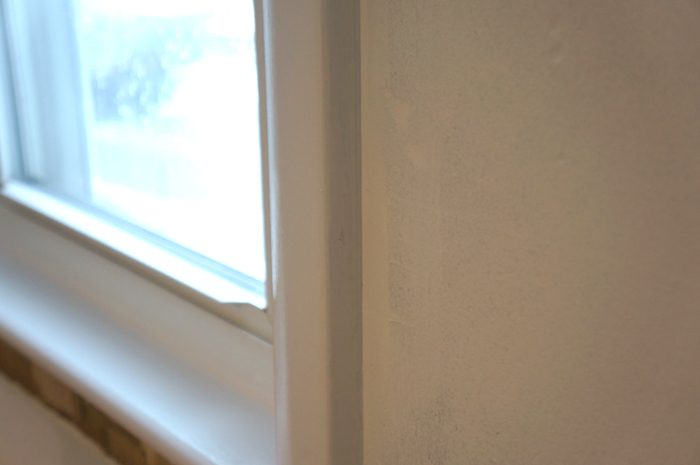 I again got a little overeager and forgot to take pics as I caulked the doorframe, but luckily I had some window molding to caulk where it had come loose (because the genius who build the old cabinets nailed them to the side of the window trims…. that’s not usually how it’s done…). 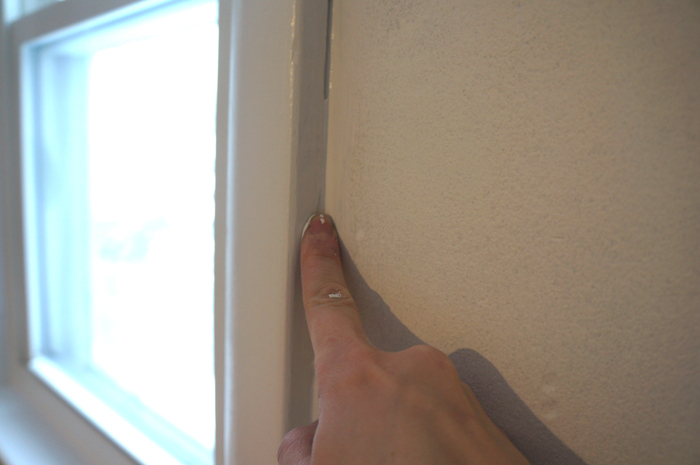 With your paintable caulk, add a small bead right in the corner. Please disregard my paint-covered hand. I’m a very neat painter, but somehow my hands get covered. 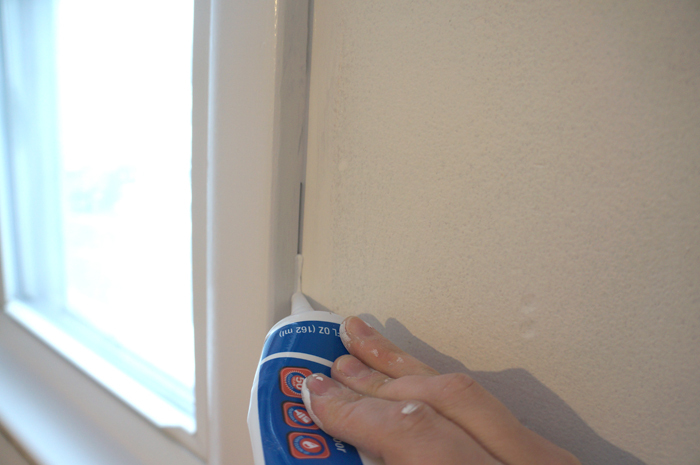 Luckily, your caulk bead doesn’t have to be perfect because you’ll smooth it all out in the next step. I’ve found that my finger is the best tool for the job, but make sure you have a wet paper towel handy to wipe the excess of your finger. When you’re all done, no one will be able to tell the molding hasn’t been there since day 1. 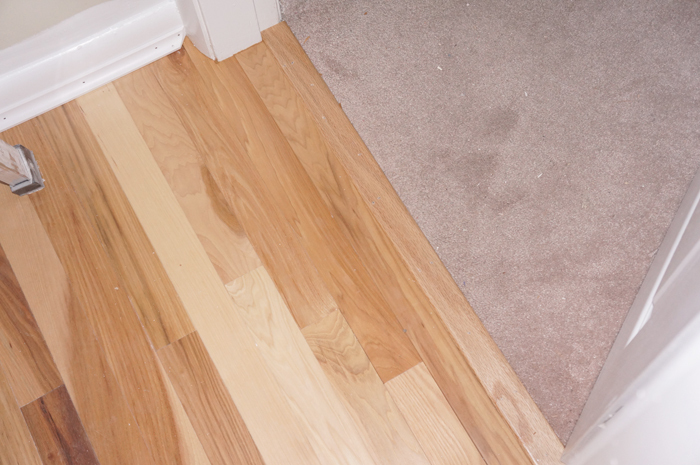 The same steps can be used to replace almost any trim in a house. 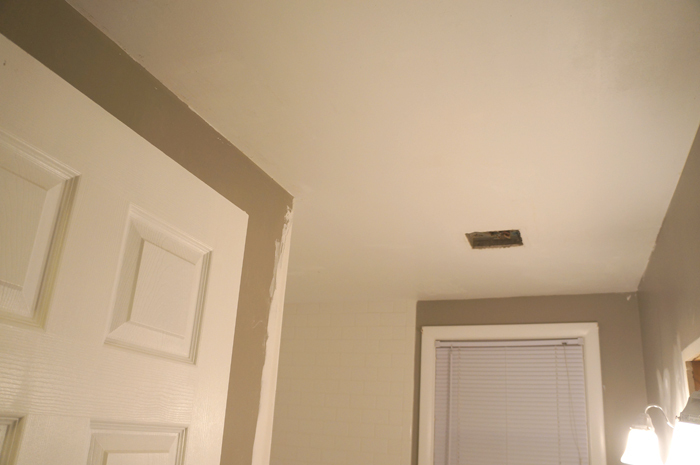 I’ve never attempted crown molding, but I know that’s a whole other beast…. 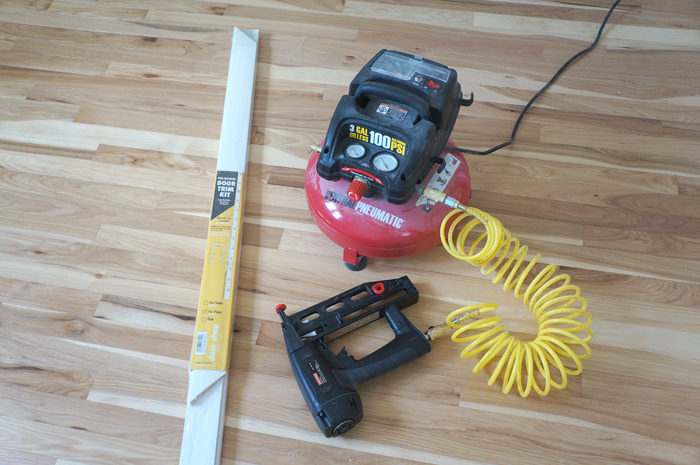 but this method can be used for base boards, chair rails, picture rails, etc. As part of the Blog Boss e-course that I’m taking, this past week’s homework was to analyze 8 blogs that rock and why. Since I’m such a blog whore, that’s a pretty easy task, so here goes! First of all, the design of this site grabs me and pulls me in. It grabs me so much, in fact, that I hired the designer for this site (who happens to be the blogger Chelsea’s hubby) to do the redesign of this lil’ ol’ blog here. I love the creative simplicity- it let’s the content take charge. The pictures are always phenomenal, but so are the DIYs. Chelsea doesn’t ramble on and on like some other bloggers (present company included, and don’t get me wrong, I loves me some blogs that DO ramble…), so the writing is always well-thought out and from the heart. Did I mention the pictures? I did? Well, they deserve to be mentioned again. The photos are always amazing and somehow elevate even the simplest subject. Look, another simple, yet well-designed blog! Guess what I’m drawn to! Pretty pictures, a nice layout, honest content. I’m easy to please. It definitely helps also, when the blogger has an awesome sense of style like Dana does. The blog’s tagline says it all “because home doesn’t happen overnight.” Amen! I love Dana’s honest style of blogging and the way she welcomes her readers into her life. We all know I have a huge blog crush on John and Sherry (like when I went to their book signing here). Talk about honest blogging (I’m seeing a trend! I like well-designed honest blogs!). 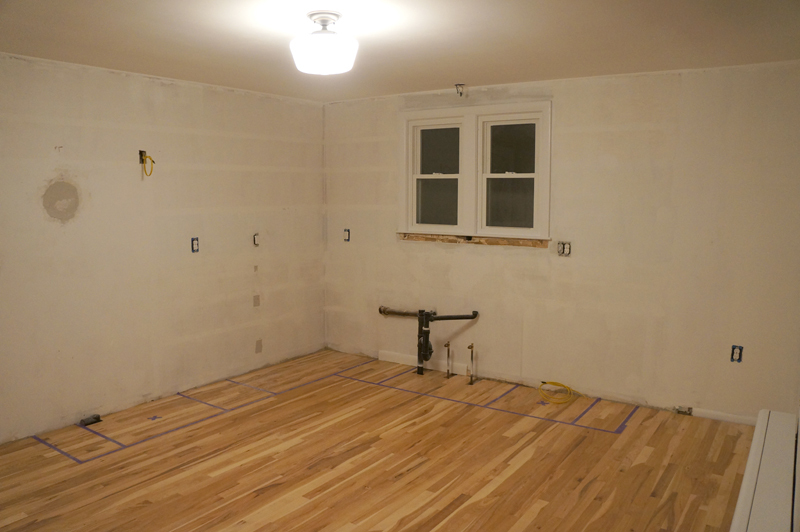 John and Sherry blog from the heart and it shows in all their projects and posts. They can make any DIY project entertaining and seem achievable even for the DIY novice- they literally wrote the book on it. I’m just waiting for them to realize that we should totally be BFFs in real life. Another blog with stylish simplicity! Well, I know what I like! I’ll admit, I’m not as much into the food posts, though. I like eating amazing food, I even appreciate amazing food styling, but I prefer to look at pretty pictures of rooms that inspire me instead of food that I don’t get to eat. Luckily A Beautiful Mess doesn’t disappoint with that either. What I appreciate most about this blog is the style. 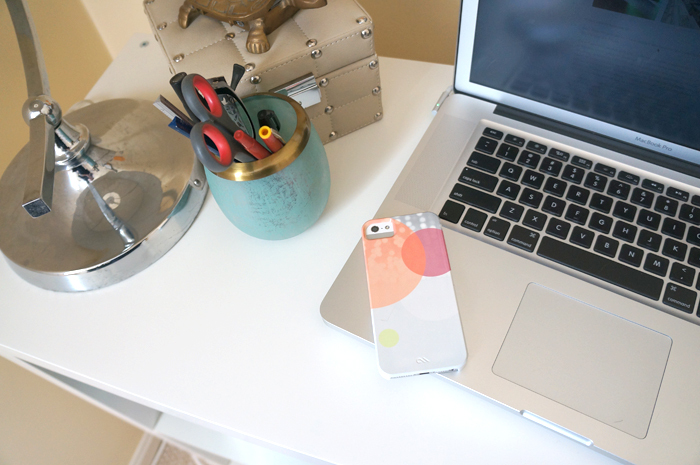 Every pic has style, every DIY has style, every giveaway… well you get the point. The style of the blog is consistent and, well, beautiful! I’ve also admitted to my girl crush on Emily Henderson who’s on the HGTV show Secrets from a Stylist, but did you know she has an awesome blog too? She gives some great behind the scenes peaks of her show and glimpses into how she sources all of the amazing pieces that she uses in her designs. That girl can style her way out of a paper bag, she’s that good. As with pretty much all of these blogs on this list, the blog is simple, stylish, honest and just beautiful to read. You can’t help but love Michelle’s personality. Well, maybe you can, but I certainly can’t. This is another one of those honest blogs that I just keep coming back to. Plus it has a cute dog. Aren’t cute pets always a perk for blogs? I hope so! Another BYW Blog Boss student, I was obviously drawn to the name. I have a thing for the word ‘serendipity’ I guess. I also have a thing for simple and consistent blog designs, so we can put a check in that column too. I love the iPhoneography posts- what a great way to visually chronicle the year! A creative blog with vintage flare, and also another BYW Blog Bloss student. She has such a great bio- visual, but still simple and personal. The fonts- oh the fonts…. Fonts rank almost as high as blogs and chair-buying on my list of addictions vices. The well-styled DIYs don’t hurt either. I’ve been doing a lot of flooring. They make me so happy I could tap dance, but that would hurt the floors and be very counterproductive, so I won’t. I do need to shave down the bottom of the basement door, so that it can open with the new floor thickness, though. 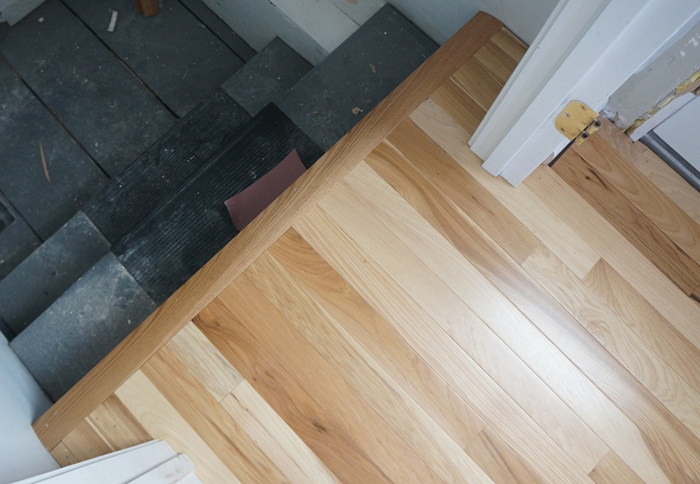 This is what it looks like heading down to the basement- pretty wood tread. 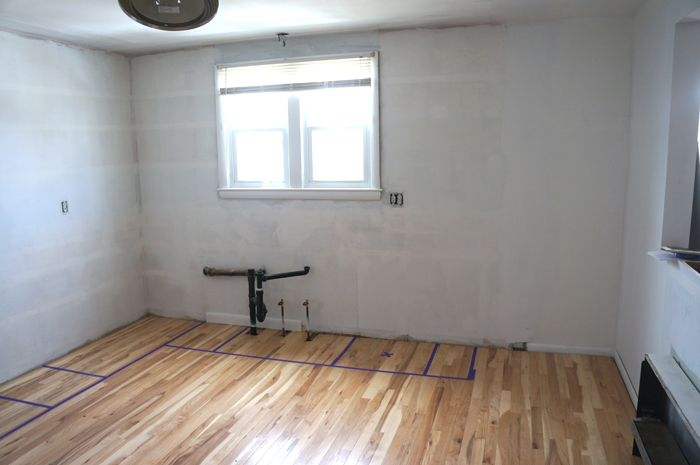 This is where our IKEA cabinets will be installed. I may be the crazy person who taped out where the cabinets are going to go to help me determine what fridge size/style to buy. May be. I think I have it figured out, but I’m going to measure the heater when I get to the house today, just to make sure before I buy appliances. 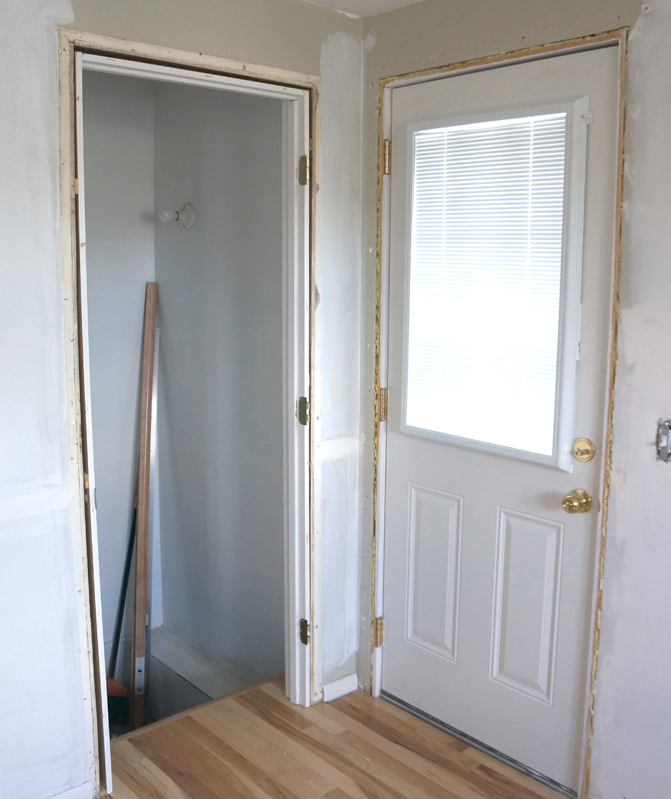 The basement door and side door also got new door trims to match the rest of the house. They had been replaced by the previous owner and were the only trims of a different style in the house. No more! 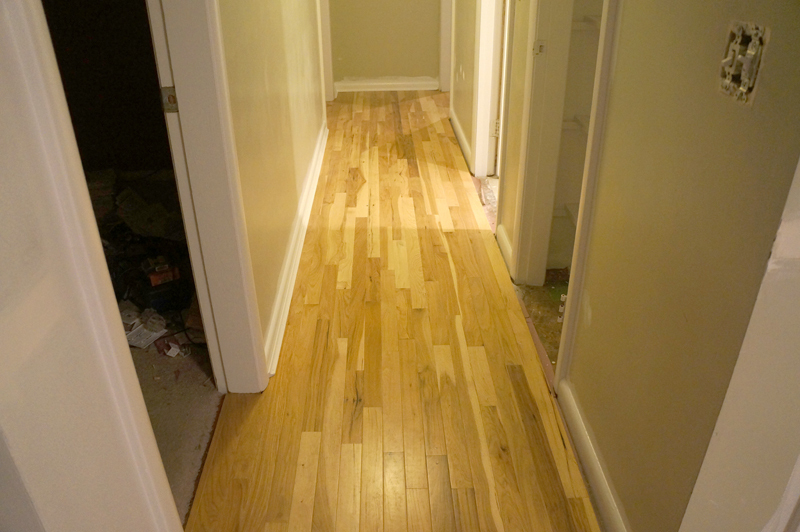 and did I mention laying lots of hard wood floors? I’m hoping next week’s progress will be in leaps and bounds! This week has been tough mentally with the flip. I’ve been going and going and going, but I’m running in water. It feels like I’ve been laying floors FOREVER, but I’m ecstatic to say that the hall and kitchen are done! 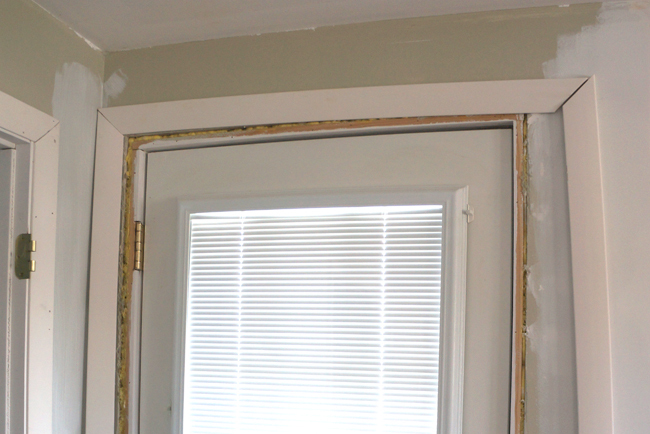 (well, with the exception of door transitions and trim, but that’s in progress). I’m working out my floor ‘tutorial’, but surprise surprise, laying hardwood floors is not easy to spell out, but SOON, I promise! I get very one-track-minded with projects, and with the magnitude of flip house projects, I’m more one-tracked than usual. My own house’s projects are suffering and I’ve been constantly at a loss of what to write here that’s not centered on the flip. Maybe you can help though! What do you like seeing here or what do you NOT like seeing here? I know you guys like DIY’s the best, but I can’t DIY all the time, so what else tickles your fancy? Would you want to see others’ DIY projects that I come across online, or do you like (or not like) when I show you an awesome room that I’ve pinned? Tell me what keeps you coming back! Hopefully I can start a few series posts and pull myself out of this mental rut. 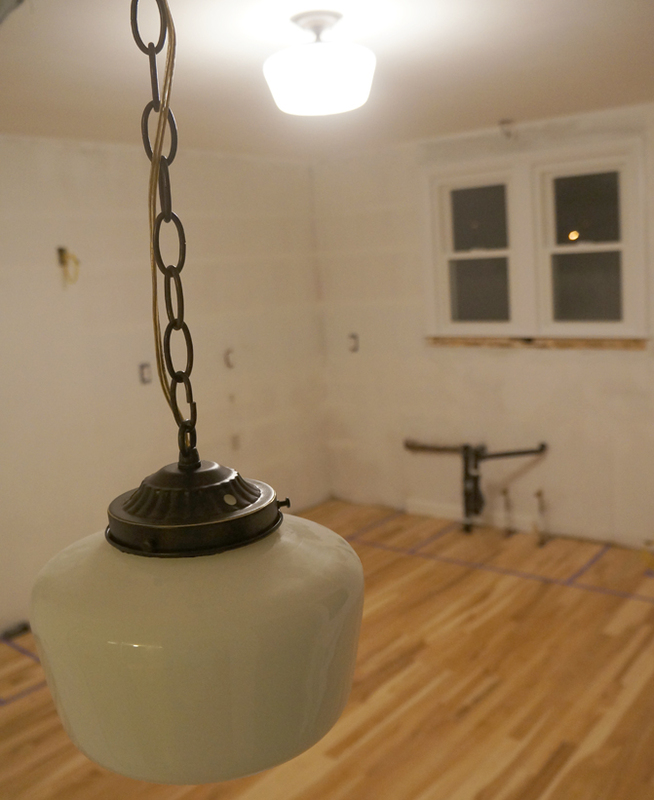 Check back tomorrow for Clark the flip house’s Week 4 update! !